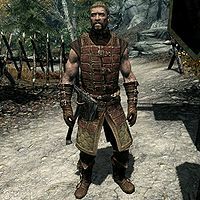 Ollrod is a Nord bandit and a member of the Dawnguard outside of Fort Dawnguard. He patrols around the gate that leads into the main area of Dayspring Canyon. He is clad in a complete set of Dawnguard light equipment. This includes the cuirass, matching pairs of gauntlets and boots, as well as a shield for blocking. He is equipped with a Dawnguard war axe and a crossbow supplemented with 12 steel bolts. He carries a torch and a 25% chance of carrying 1-9 gold. This page was last modified on 31 March 2013, at 21:03.